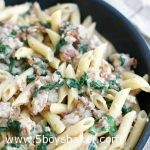 Pasta is one thing I can make for my boys that I can almost always guarantee they will eat. But when I made this Skillet Penne and Sausage Dinner the other night, I was a little worried about their reaction for two reasons. (1) There is “green stuff (a.k.a. spinach) in it; and (2) There are “little red things” in it. I didn’t have high hopes to be honest, but I wanted to try it because I love spinach and sun-dried tomatoes. I figured if my boys didn’t like it, I would tell them they could go hungry or eat cold cereal (sound familiar?). I was completely blown away when they all devoured it aaaand, didn’t even complain about the “green and red things” and kept telling me how good it was. Phew! I love it when I’m wrong :)! This pasta is delicious! 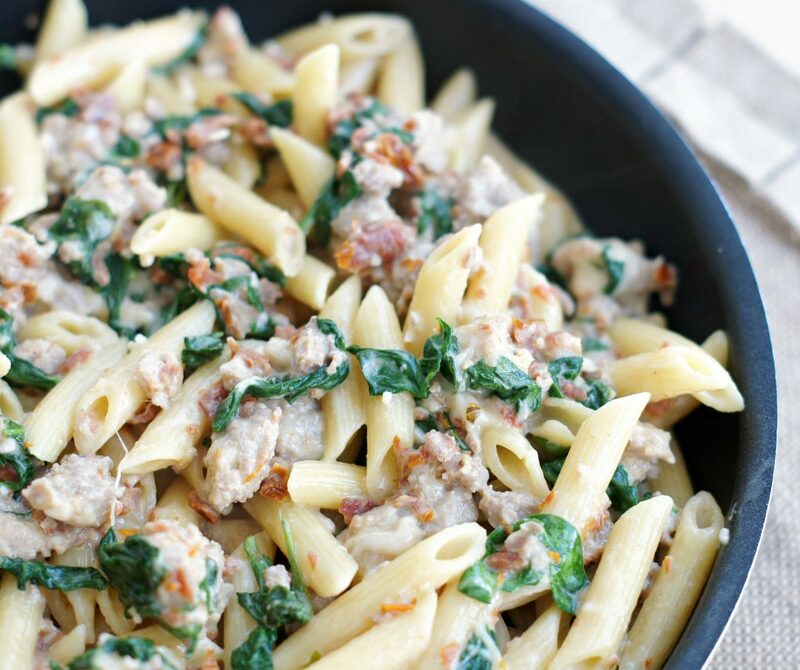 Spicy or sweet turkey sausage, sun-dried tomatoes and hearty spinach make up the flavors of this skillet dinner. I’ve said it many times before, but I just love meals that are made exclusively in one pot or skillet. You’ve got to try this. 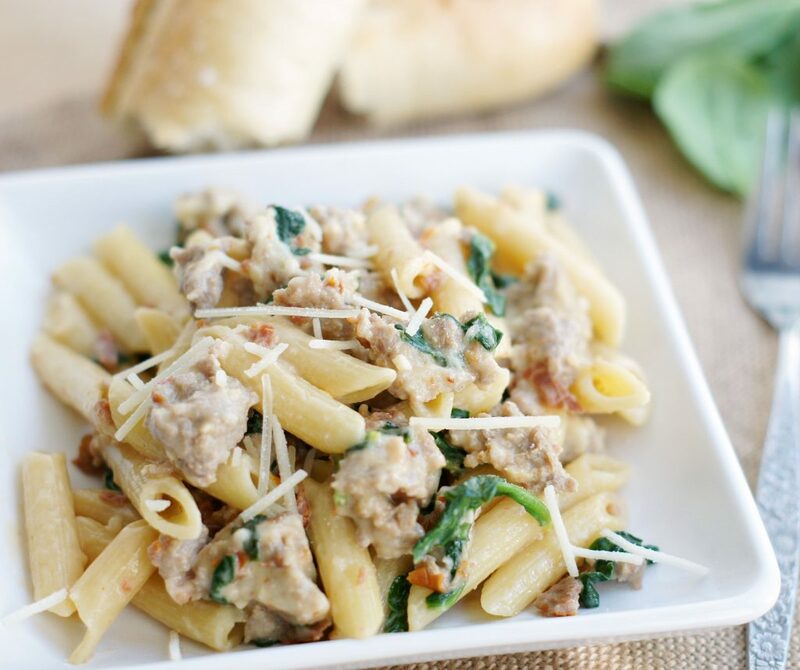 This skillet penne & sausage dinner is so delicious and so simple to make. Heat olive oil in a 12-inch nonstick skillet over medium heat until shimmering. Add the onion and 1/2 teaspoon salt and cook until softened, about 5 minutes. Add the sausage and cook until lightly browned and no longer pink about 5 minutes. Stir in the garlic and cook until fragrant, about 15 seconds. Sprinkle the tomatoes and penne evenly over the sausage. Pour the broth and cream over the pasta Cover and bring to a boil. Reduce the heat to medium-low and continue to simmer, stirring occasionally, until the pasta is tender, about 10-12 minutes. Stir in the spinach, a handful at at time, and cook until wilted, about 2 minutes. Stir in the Parmesan and season with salt and pepper to taste. I used sweet Italian Sausage but will use spicy next time. We loved this but I think it would be even better with a bit of a kick from spicy sausage. Thanks Annamarie! So glad you enjoyed it. We love it. This is my husband’s new favorite pasta dish! He requested that I make a huge batch of it so he can eat it for lunch every day! Thanks Melanie! This is a good one! Elder Ludlow will be at our house for dinner Thursday and I’m making this one! Thank you for feeding him! All the members there take such good care of the missionaries❤️. He will love this.